Say good-bye to paperwork, copiers and manual data entry. With INUVIO’s ScanSharp software, free your physician practice from the inordinate amount of time required to collect, copy and manually re-enter patient data. ScanSharp is an easy-to-use digital scanning and imaging software application that enables the scanning of all types of patient cards and documents and the seamless integration of this critical information into your PM/EMR systems. ScanSharp works with a variety of digital scanning hardware to capture critical patient data in seconds eliminating photocopying, improving practice workflow (or accelerating patient inflow), eliminating data entry mistakes and over the course of a year, saving your practice hundreds of man-hours in time and labor each year. ScanSharp automatically detects when a document is inserted and begins the scanning process so there is no need to push any buttons or click a mouse. ScanSharp software is designed to work well with all TWAIN compatible scanning and imaging hardware. 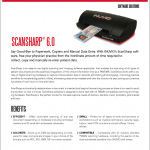 ScanSharp is the perfect choice for the data capture needs of doctors, dentists, vision providers, pharmacies and labs. > EFFICIENT – Offers dual-sided scanning of any size document (depending on hardware) including laminated medical and ID cards with embossed characters. > ACCURATE – Scans up to 600 dpi for clear and accurate images in your choice of file formats such as PDF, JPG, BMP, GIF and other varieties. > SMALL FOOTPRINT – Perfect for all types of work environments or workstations such as medical admissions, security registration, retail POS counters and small offices / home offices. > COMPATIBLE – Compatible with all industry standard TWAIN scanning hardware, including thousands of devices worldwide available from INUVIO and others. > SUPPORT – Free two-year, unlimited, industry-leading, warranty support and updates. > DOCUMENT COMPATIBILITY – Digitally capture all types of patient information, including drivers licenses, insurance cards, medical records, consultation notes, lab requisitions and results, patient demographic information, consents and integrate it all seamlessly into your PM/EMR. > SCANNING AUTOMATION – Immediately scans once a card or document is inserted into the scanner without pressing a button. Automatically crops any size image for clean scans with no black borders Auto-save to a directory of your choice on a local computer or server. > WORKFLOW OPTIONS – Merges both sides into a single image so all data is visible on screen. Unlimited configurations for complete customized workflows. Set password to lock-down configuration settings. Scan up to 8 sides into a single image. Choose up to 4 different formats for organizing the combined images. Application mode or minimized Kiosk mode. Timeout feature to ensure completed scanning cycles. Set automatic image rotation. > SCANNING OPTIONS – Scan in true color (24bit), grayscale (8bit) or black & white (1bit). Set image resolution from 75 DPI to 600 DPI for ideal image quality and size. > FILE SAVING OPTIONS – 9 popular file formats to choose from – BMP, JPEG, TIFF, GIF, PDF or PNG. Save directly to the clipboard for pasting capability. Automatically saves with a static name, a numerically ascending name or timestamp. Or manually name the file for complete control. Advanced compression options to control file size. > PRINTING OPTIONS – Auto-print to any printer on network. Auto-print one or multiple copies. Control over where the image appears on the page. Zoom printing up to 300% for easy to read images. Insert data onto the print copy as a header or footer (static text, time stamp or file name and path info). > WATERMARKING OPTIONS – Insert data into the image as a header, footer or on the image itself (static text, time stamp or file name and path info). > CROPPING OPTIONS – Further image cropping to create separate images from the original image. > MAGNETIC READER – Magnetic reader support for raw data capture with appropriate hardware. > MEANINGFUL USE – Meets “Meaningful Use” and EHR/EMR requirements. > WARRANTY – Exclusive, inductry-leading 24-month warranty. > SUPPORT – Annual support includes unlimited technical support, license transfers, and software updates.